“Dark Wings of Steel” is the first album from Rhapsody Of Fire born without the creative partnership of Luca Turilli and Alex Staropoli. In fact, following an (allegedly) amicable divorce, guitarist Turilli is now focusing on his own band Luca Turilli’s Rhapsody. This new album seems to have a greater reliance on songwriting as contrasted with the cinematic soundscapes of previous works. Nevertheless, the operatic choirs and symphonic elements still pervade the band’s music. Acoustic instruments still mingle with heavy-sounding guitars and Power Metal dynamics. As a R.O.F. fan, I should be happy therefore and, well…I am happy though far from ecstatic. Most often, a Metal album is only as good as its songwriting quality and “Dark Wings Of Steel” has a serious weakness here. For instance overall the riffs and tempo breaks are somewhat boring. Staropoli is still a master of his craft but his keyboards tend to throttle the rhythm section of the album. In fact brothers Oliver and Alex Holzwarth – respectively on bass and drums – just seem to be filling in most of the time. I mean you just have to listen to “Rain Of A Thousand Flames” (2001) or “Dawn Of Victroy” (2000) to be reminded that the band is capable of some truly great drumming. It seems the missing chemistry between Turilli and Staropoli has negatively affected the music. And, to make it clear, I have no gripes with new recruit Roby De Micheli because he’s clearly a talented guitarist. With all my disaffections, there still are a several moments of brilliance throughout the album even if most are short-lived. ‘Silver Lake of Tears’ is one of the few songs that convinces from start to end. The song is nothing R.O.F. haven’t done before really but it’s quite a furious and exciting song. ‘Custode Di Pace’ (‘Guardian Of Peace’) is the usual ballad with lyrics in the band’s native Italian and it’s quite a good one…probably one of their best ballads in fact. Amongst the other great moments are the melodies in ‘A Tale Of Magic’. Fabio Lione proves to be an exceptional singer, as always. I also appreciated the fact that R.O.F. are consciously trying to evolve their sound even though, as suggested earlier, such ideas often fall flat. 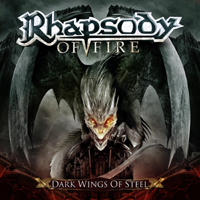 In the past some Rhapsody Of Fire albums took some time to grow on me and maybe the same will happen with “Dark Wings of Steel”. Until…or if…that happens, I’ve got no shortage of top notch material to delve into from the band’s repertoire.